Our founding Sisters provided nursing care to those in need and established themselves as pioneers in the health care field. Please click here to see a list of our missions from 1875 to the present. Missionary Sisters were sent to China in 1925 in celebration of the 50-year anniversary of the American Province. In 1948, most of the Chinese Sisters fled China to come to Springfield – three Sisters stayed in China while two migrated to Japan to begin serving the post-bomb victims. From 1968-2002, we served in Kaoshiung, Taiwan. Sisters also served in Arizona and New Mexico spanning 1940-1990. On July 28, 1999, we began the San Damiano Mission (Kemondo, Tanzania) and continued the service to the people until May 16, 2017. Please click here for more information about this Mission. Throughout our history, we have been blessed with visionary members of our Community who accepted the responsibility to serve as leaders. These women recognized their role as servant leaders with their Franciscan Sisters as they cared for the needs of our Community, provided direction to our health care ministry, and founds ways for us to respond to the needs of the time. Please click on this link for a listing of our Superiors since 1875. 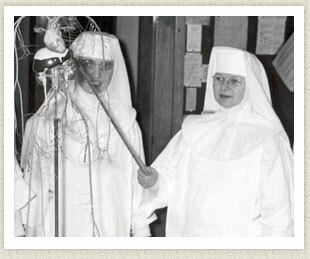 Our early Sisters established schools to ensure a high level of nursing. To this end, a School of Nursing was founded in 1886 to train the Sisters in Springfield, IL, (1886-present) and Eau Claire, WI (1917-1932). Skills were taught for clinical and technical support services including anesthesia, laboratory, EEG, x-ray and pastoral care. 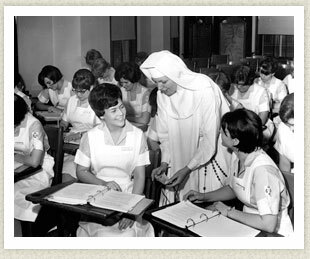 St. John's College of Nursing exists today under the auspice of St. John's Hospital in Springfield. Sisters still serve on the board of the college. 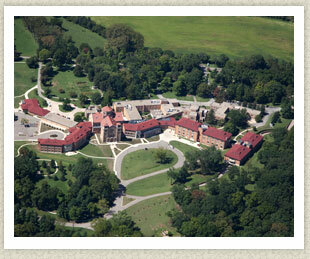 For more information on St. John's College of Nursing click here. In 1899, an English text, "The Nursing Sister - A Manual for Candidates and Novices of Hospital Communities" - was published and written by our Sisters at St. John's Hospital School of Nursing. In addition, they published a companion guide “Points for the Clinical Record”. Three other editions of “The Nursing Sister” followed (1900, 1903, and 1905 respectfully) and were used through the mid 1920s. Also, the books were requested by other nursing schools in the United States. The first edition is entered according to Act of Congress, in the year 1899, in the office of the Librarian of Congress. Please click here to access the 1899 edition. Please click here to access the 1900 edition. Please click here to access the 1901 edition. Please click here to access the 1905 edition. In 1917, our Sisters purchased 500 acres of land five miles northeast of Springfield for the erection of St. John's Tuberculosis Sanitarium and later the construction of St. Francis of Assisi Church and St. Francis Convent.